What’s interesting to me about the Star Trek phenomenon, among many things, is the way its fans have taken ownership of the franchise. I guess that what happens when an audience member goes from being a fan to being, well, an addict. Harry Potter has its addicts. Lord of the Rings has its addicts. And I’m not knocking that. It must feel flattering—although also a little scary—to know that some people spend a good measure of each day in the universe of your film(s), whether they’re in a theater or not. A bone to pick. The opening scene gives us Kirk being chased through an alien jungle. He’s disobeyed the prime directive in stopping by to try to save a planet from a volcano that’s about to turn its residents into lawn statuary. Along the way, Kirk has nabbed an important religious document from the tribe. But the issue for our intrepid explorers is that the aliens shouldn’t see the Enterprise. Somehow, that would be going too far. That would be a more flagrant violation of the prime directive than stealing from them. Oh yes, and altering their fate on a global scale. Well, now I sound like a fan boy. Based loosely on Star Trek II: The Wrath of Khan—actually a kind of prequel to it—Star Trek: Into Darkness gives us the fledgling crew on a mission to track down and destroy a vicious terrorist. The thrills are many. The plot twists surprise. Well, some of them. OK, one of them. The actors give uncanny emulations of the by-now archetypal characters. The high-tech world is even more high-tech. Somehow, though Abrams picks up the story line at an earlier point in the history of the Star Trek voyages, the technology seems more advanced than it does later, when Kirk, Spock, and the other space cowboys are older. The villain is played by English actor Benedict Cumberbatch, who singlehandedly revived the Sherlock Holmes franchise. He’s not a physically imposing actor, though he is tall, but his piercing stare and deep voice more than convince us that he’s a force to be reckoned with. 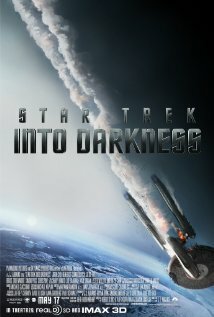 There haven’t been many complaints from fans and addicts about Star Trek: Into Darkness. What there is can be traced, I think, to the fact that this is the second outing from director J.J. Abrams. We’ve seen the bag of tricks he brings to the franchise. The shine has worn off a little. What, for me, is still fresh, though, is the way the effort to give audiences rougher-edged residents of the Star Trek universe. They’re pricklier, thornier, driven by mixed motives. They’re not the pure souls Star Trek creator Gene Roddenberry insisted on. Kirk, in particular, as played by Chris Pine, suffers from impulse control, appetite, delusions of grandeur, etc. The same was true of William Shatner’s Kirk, but to a far lesser extent. Shatner’s Kirk always made you think he knew what he was doing. Pine’s Kirk is more tormented by doubt, more flummoxed by the unexpected. Spock, too, played admirably by Zachary Quinto, is allowed some emotional latitude, literally, from Leonard Nimoy’s hyper-rational Spock. And it plays well, since Spock is only half-Vulcan. Zoe Saldana does a nice job playing Lt. Uhuru, and the character is given more to do than most women in the original franchise. But it’s still not enough. Even her big confrontation scene with the Klingons doesn’t come to enough. Not her fault. She can only do so much with the material she’s given. From its earliest days, Star Trek touted tolerance of, and equality for, all races, creeds, and cultures. But for women, not so much. It’s a mistake that was corrected in the other franchise spin-offs, but the original Star Trek is still a boys’ world. At its heart, Star Trek has always been a buddy picture, with Kirk and Spock constantly testing the limits of their bromance. Add to this a worlds-in-collision theme, some classic space battles and standoffs, and a few chases, and you’ll be ready to sign on as a Federation cadet. A note to the United Federation of Planets: You’ve got to stop giving The Enterprise to this gang of hooligans! Every time they take it out for a joyride, they bring it back in pieces! Dudes of the Future, your interstellar spaceship insurance must be through the roof by now!